Regardless of how smart, hard-working, or talented we are, every one of us faces rejection at one time or another. What matters is how we deal with it. If you didn't get into your first choice school—and maybe not your second or third either—it's okay to spend some time feeling a bit low. It happened to me. I cried in my history classroom after I was "denied" by my first and second choice schools. My teacher, Mr. Sokolow, offered some wisdom that has remained with me ever since: "Do the best you can with what you have." Recently I found out that he was quoting the former world heavyweight boxing champion Joe Louis. Boxers know that going into the ring means they're going to have to take some blows. Painful as it may be, that is what we often have to do to achieve our most cherished goals in life. So, if you don't get into your top choice schools, don't give up. Do what you can to improve your chances. Take a summer school course to show that you really can get an A in Biology. Secure a summer internship in your area of interest and have a mentor write about your abilities. Consider going on a gap year program—many of them offer scholarships. You can experience an Israel program organized by the Reform Movement such as Netzer Year, or a "secular yeshiva" where you can study Jewish texts without being obligated to partake in religious observance. You can learn and do volunteer work in Israel in a pluralistic setting. Or you can travel to Jewish communities around the world, as did Suzy Lee Weiss, the most famous young Jewish college reject of 2013, as featured on the Today Show. Being proactive will make you a stronger candidate and prove—to yourself and others—that you are the kind of person who is willing to put in the work to achieve your goals. When you're ready, reapply either after a gap year or as a transfer student both to the schools that rejected you and those you might not have considered the first time around. You may still get rejected. What you also need to know is that a rejection letter is not a judgment of your worth. I learned that lesson the hard way in my 20s. Wanting to publish fiction, I sent a story to the venerable New Yorker magazine. When I received a standard rejection letter, I concluded that I wasn't a good writer. I didn't know then that most New Yorker stories are submitted by literary agents—very, very few are taken from their "slush pile" of blind submissions—and that many other magazines publish stories by unknown writers who do not have agents. I'm embarrassed to say that for 10 years, I wrote stories but did not submit them anywhere for fear of rejection. Finally, while taking writing classes, I met other writers who helped me understand that a rejection letter from The New Yorker was not a rejection of me or my work, but a reality check—countless talented writers are vying for a few spots in the nation's top magazines. Even now, after having had many pieces published, including in The New York Times online, I still get numerous rejections for every piece that's accepted. But that's okay now, because I know the odds. One more thing. Whenever I get a rejection letter, I think of Rebbe Nachman of Bratslav's words: "Jews, it is forbidden to despair." When life deals you a blow, get up, dust yourself off, and recalculate your next move. Remember that "do the best you can with what you have" advice, while still striving to improve. Here's the big lesson: Try to make rejection your friend. It can be a catalyst to rethinking and clarifying your goals and opening up your mind to new options. You may end up being extremely happy at one of the colleges you have gotten into, as I eventually did. One day you may even look back and be grateful for that college rejection which led your life in a great new direction. Beth Kissileff is a freelance writer, speaker, instructor, and editor of the anthology Reading Genesis (Continuum Books, 2013). 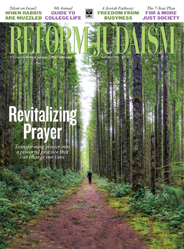 A new movement is emerging to transform prayer into a more powerful and compelling practice, building upon our ancestors’ recognition that we truly can effect change through prayer.